Two francophone teams battling for a place in the final: the France vs Belgium match in the 2018 FIFA World Cup was a particularly exciting moment for us. Ilini being based in France, we supported les Bleus with all our heart and we joyfully celebrated a hard-fought victory. But we also have a lot of admiration for les Diables rouges, a truly impressive team that equally deserved to win. In the run-up to the game, we wanted to share our excitement and created two resources which we shared with our community on our Facebook page. 🇫🇷️ 🇧🇪 French vs Belgian Football Vocabulary ⚽😉Whatever side you're taking, get ready for tonight! For a French person, watching a football game on Belgian TV can be confusing at first. A corner is called a “coup de coin”, “un carton rouge” (a red card) becomes “une carte rouge” and a “goal” isn’t a goalkeeper but… a goal, which indeed is more correct. So with the help of Belgian friends, we compiled a number of these differences into the comparative table above. Interestingly, several Belgian followers were actually surprised to find some of these words in the list. One of them, for instance, said that Belgians also say “un pénalty, un maillot, un arbitre”. This is true: the distinction isn’t clear-cut, and some words on the left may indeed be used in Belgium too. In addition, it seems that some of the “Belgian” words aren’t actually used in the whole of Belgium, but only in certain regions. Feel free to add your comments to the discussion! 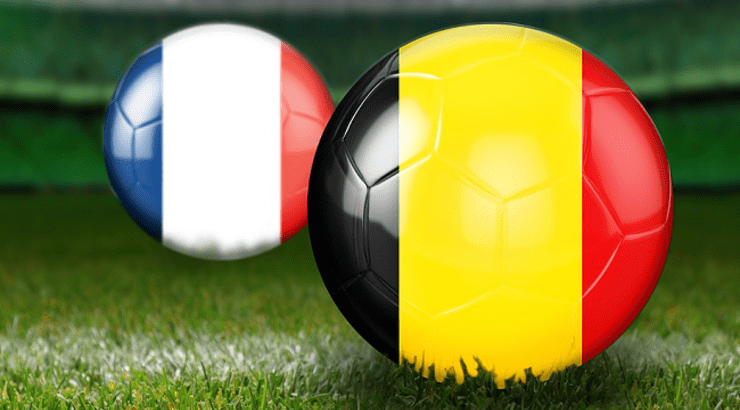 Belgium vs France: Old Frenemies. A little warm-up ahead of the World Cup semi-finals! This video is based on a scene from the 2010 French comedy film Rien à déclarer (Nothing to declare) by stand-up comedian, actor and film director Dany Boon. We added English subtitles to the video and edited the scene to mimic a football game. In this film, a Belgian customs officer (Benoît Poelvoorde) and his French counterpart (Dany Boon) have to deal with the consequences of the removal of border controls within the European Union. Dany Boon speaks with a (rather light) Northern, “Ch’ti” accent. You’ve probably heard about Dany Boon’s other film, Bienvenue chez les Ch’tis. He uses the expression “foutre le brun”, which in some regions of France (forgive the vulgarity) means “foutre la merde” (make a mess, or stir up the sh*t). Dany Boon’s imitation of the Belgian accent is an awful one. It is how the French think Belgians speak (inspired by French comedian Coluche’s imitations in the 1980s). This is something that deeply irritates French-speaking Belgians! Benoît Poelvoorde uses the expression “bleu-blanc-bec”, which we couldn’t translate literally into English. It is a contraction of “bleu blanc rouge”, the French flag’s colours, and “blanc bec”, a derogatory way to call a pretentious novice. This short scene shows some of the main clichés and misunderstandings that separate France and Belgium. An endless source of comedy! For more French videos with subtitles, online learning tools, quizzes and exercices, visit our homepage. This blog is where our team shares news and ideas for learners and teachers of French. Don’t know Ilini yet? Visit ilini.com and learn real-life French with news & entertainment videos!